I love breakfast food. I just…hate cooking it at breakfast time. When I get up in the morning, I’d much rather pour a bowl of cereal and stumble bleary-eyed out to the table than start scrambling eggs. However, everyone in my family really appreciates special breakfasts, so I’ve started looking for recipes where the bulk of the preparation can be done ahead of time. (The night before is great; I get a second wind once the kids are all in bed.) Yesterday I stumbled across Grocery Shrink’s Overnight French Toast Casserole and I wanted to try it immediately. And for good reason. French toast is a great simple staple and as long as you have bread, milk, and eggs it’s easy to throw together. However, when hungry kids are waiting for breakfast all the dipping, flipping, and standing by the griddle gets tiresome, especially when you have to decide between feeding kids as soon as food is ready (so you sit down alone with the last two slices) or making them wait until all of it is ready (which, if they are like my kids, means they will be begging the whole time and the first slices will be cold). With this version, you can just turn on the oven and sneak it in there before the kids even realize that you’re cooking – which means that by the time they start to say “Mommy, I’m hungry!” you can tell them it’ll be ready any minute. Want to make some? Mix eggs, milk, sugar, salt, and vanilla together in large bowl. Spray 9×13″ pan and fill with bread and egg mixture. 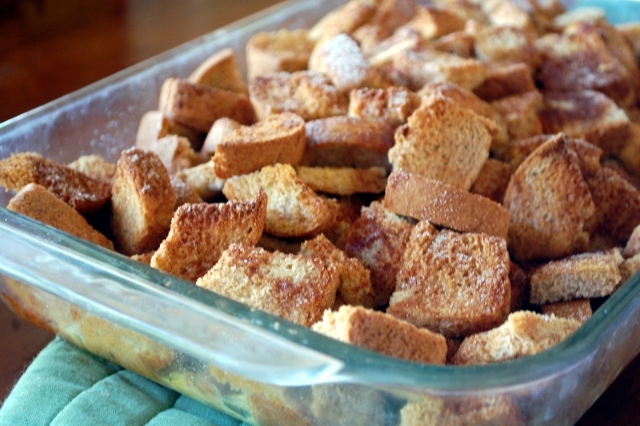 Chop butter into small pieces and sprinkle across top; sprinkle cinnamon and sugar mixture across top. Bake for 45 minutes, serve with syrup. *Grocery Shrink’s recipe has you mix it and refrigerate it in the pan…I did that and mine turned out crunchy on top and soggy on the bottom. I didn’t think to stir it up, but I think that refrigerating it in the bowl and then dumping it into the pan will have the wetter pieces on the top and the drier pieces on the bottom, which would allow it to cook more evenly. Even crunchy/soggy, this turned out good enough I’m willing to try it again! Delish! Is this what bread pudding is like? You know, I have no idea, but aside from the texture issues it was a pretty good French Toast facsimile. It does sound bread puddingish. But it would have raisins – one of the twins wouldn’t approve.